As far as domesticated animals go, the rabbit is, frankly, a noob. French monks tamed wild rabbits about 1,400 years ago, compared with 10,000 years for sheep and up to 30,000 years for dogs. 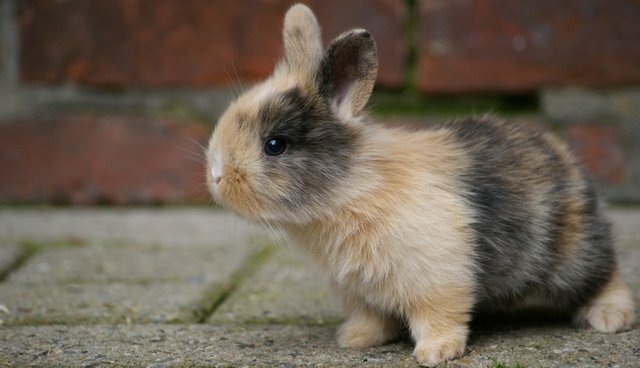 What separates a timid wild bunny and a calm tame rabbit are about 100 little tweaks in genetic information, biologists recently found, but no major differences in a single gene. It's quite unlikely there's such a thing as a "domestication gene," says researcher Leif Andersson, a genetic expert who studies domesticated animals at Texas A&M; University, in a statement. The key changes between wild and tame rabbits is how afraid these animals become around humans. "Selection during domestication might have focused on tameness and lack of fear," University of Leicester biologist Pat Heslop-Harrison tells the New Scientist. "As a farmer, you neither want the animal to hurt you, nor for the animal to die from stress." A untamed rabbit's main defense, to escape everything from hungry foxes to eagles, is a quick getaway. But because the process of domestication has inhibited this flight response - particularly with changes to a rabbit's brain and nervous system - it's important these animals don't encounter threats in their environment, as they might not react properly. The American Society for the Prevention of Cruelty to Animals, for example, recommends housing pet rabbits inside. And although these domesticated animals are calmer, they won't be completely chill at the sight of a threat. Surprised rabbits occasionally "die of heart attacks from the very approach of a predator or vandal," the ASPCA points out. But if you lie down softly, holding lots of bunny chow - at least on one Japanese island - you might just become the best friend to dozens of rabbits.